The frequency of preneoplastic lesions of the lung and bronchial mucosa as well as potential genotype alterations in spatial relationship to pulmonary malignancies still need intensive investigations in order to understand the occurrence and manifestation of lung cancer in detail. To investigate the contemporary manifestation of lung cancer precursor lesions, peripheral (non-neoplastic) lung parenchyma and bronchial mucosa of operated lung carcinomas were analyzed at distinct distances (1, 2, 3, and 4 cm) from the tumor boundary for pre-neoplastic lesions - atypical adenomatoid hyperplasia (AAH) and squamous cell dysplasia (SCD), in 150 surgical specimens. Short-term tissue cultures of additional 55 primary and secondary lung tumors and their surrounding non-neoplastic bronchial mucosa were performed at the same distances in order to search for chromosome alterations, i.e. genotype aberrations. In phenotype observations, atypical adenomatoid hyperplasia was noted in 19/150 (13%) cases, and squamous cell dysplasia in 46/150 (31%) cases. The degree of cellular atypia decreased with increasing distance from the tumor boundary in both AAH and SCM. AAH was observed more frequently in adenocarcinomas, SCQ more frequently in squamous cell carcinomas. In genotype observations, the average number of abnormal metaphases measured 4.5/10 high power fields (HPF) in primary lung carcinomas, and only 2/10 in metastases. Data indicate that the so-called preneoplastic lesions in the lung are not completely tumor-precursor lesions, but, in addition, induced by the tumor itself. There were investigated 80 patients with superficial urothelial carcinoma of the urinary bladder (Ta and T1). All cases had a minimum follow-up of 36 months. Patients were selected in order to form two subgroups. The first group (n = 28) had no recurrence during the follow-up, and in the second (n = 52) each patient had a minimum of two recurrences. The pathologic diagnosis was performed on archive slides stained with haematoxylin-eosin. Archive smears performed at the moment of the primary diagnosis from voided urine were discolored, and used for immunocytochemistry. It was investigated the expression of cytokeratin 20, high molecular weight cytokeratin 34betaE12, and overexpression of HER-2/neu protein. Microwave antigen retrieval was performed in all immunocytochemical procedures. The working system was LSAB2 and EnVision, and diaminobenzidine was used as chromogen. The initial conventional cytology was positive for malignant cells in all cases. Cytokeratin 20 was positive in 92.85% of cases without recurrences, and in 94.23% of cases with recurrences. High molecular weight cytokeratin was expressed in 42.85% of cases without recurrence and in 63.46% of patients with recurrences. The overexpression of HER-2/neu protein was found in 7.14% of cases of the first group, and in 84.61% of cases of the second group. Our results support the idea that HER-2/neu and high molecular weight cytokeratin may be used as markers to predict recurrence in superficial urothelial carcinoma. Microscopically features in papillary intracystic carcinoma are arbitrary but the immunohistochemical characteristics of the tumor provide important information for the diagnosis. SMA, factor VIII, S-100 Protein, Cytokeratin together with Calponin can be used to assist in the interpretation of difficult papillary lesions. Our study aims to present the principal and the advantage of using the Liquid Based Cytology method by Cytoscreen system, as an alternative to the conventional Babes-Papanicolaou test, by reducing the false negative results frequency due to the poor quality of the smears and the epithelial cell screening by the blood elements, mucus or inflammatory exudates. 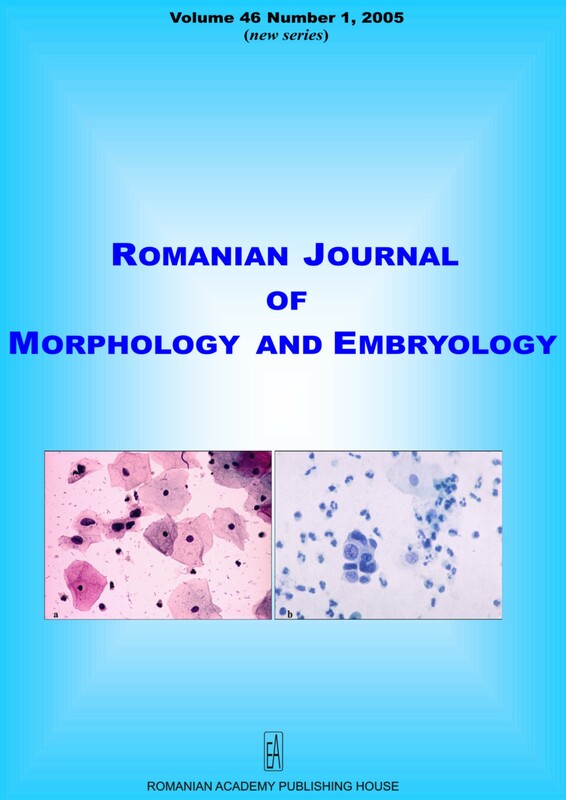 A set of 1054 female patients was available to be investigated during 2002-2004 both in the Clinical Gynecology of The Clinical Hospital Filantropia and the Clinic of Oncology of the Clinical County Emergency Hospital of Craiova; the patients were from the rural and urban places as well; they underwent cytologic screening by Cytoscreen method. We simultaneously performed the cytologic exam by using both the Cytoscreen and the conventional Papanicolaou methods in 220 patients; the rest of them, namely 834 patients, were examined just by Cytoscreen method. The samples were processed in the Laboratory of Pathology and Cytology of the Clinical County Emergency Hospital of Craiova. The smears were fixed in the absolute ethanol for minimum five minutes than was performed the Papanicolaou stain. The diagnosis was according to Bethesda System 2001. Most of the patients (85.87%) were 21-50 aged. For the group of those tested by Cytoscrren, the rate of the "satisfactory smears" was significant increase (82.27% compared to 65.45% of the patients examined by using only the conventional method). The positive results were 5.44% compared to 2.27%. More accurate diagnosis of high degrees squamous intraepithelial lesions (1.36% compared to one case - 0.45%), of low degree lesions (4 cases - 1.81% compared to 2 cases - 0.91%) and the atypical squamous cells with undetermined significance (1.36% Cytoscreen tested compared with 0.91%). Cytologic diagnosis was enforced by biopsy with histopathologic exam for four of 10 cases; the rest of the patients did not present for biopsy to be performed. In one case, HSIL diagnosis was false negative as the biopsy result was well-differentiated invasive squamous carcinoma. Both the diagnosis sensitivity and the smears fezability were significantly improved by using Cytoscreen method. Objective - evaluate the antigen profile of cellular population from basal cell adenomas. Material and methods - histopathological and immunohistochemical evaluation of four-salivary gland basal cell adenomas; the pathological samples were provided by the Oral Maxilla Facial Surgery Department of the Clinical County Hospital from Craiova. Results - all basal cell adenoma exhibit differentiation toward three cell phenotypes: ductal luminal, basal and myoepithelial. Conclusions - the antigen profile of these tumors closely regard with other variants of salivary gland adenomas, such as pleomorphic adenoma and myoepithelioma. Therefore, we can conclude that these tumors had a common origin, most probably from intercalated ducts and the proportion of those three cellular types, their cytoarhitectural arrangements and the quantity of extracellular matrix production can do the differentiation between them. We studied 24 selected breast tumors and three lymph nodes metastasis from patients with breast carcinoma. The biopsies were formalin-fixed, paraffin-embedded and sections were stained with Hematoxylin-Eosin. Additional sections from each case were immunostained for prostate specific antigen (PSA), using the EnVision technique. PSA was detected in 7% of normal breast tissues, in 54.5% of benign tumors and 46.5% of malignant tumors. The lesions with apocrine metaplasia were intense and constantly positive, the cystic dilated ducts and the areas with mastopathy were negative. Intense staining for PSA has been found in well-differentiated tumors, while the undifferentiated tumors were usually PSA-negative. The PSA-positivity in two of the three lymph nodes metastasis indicates that PSA immunoreactivity alone is not an individual prognostic indicator, but it correlates with the hormonal status of the female body. We discuss the results in terms of clinical implications of PSA immunoreactivity detection in mammary gland and other extra-prostatic sources. We retrospectively evaluate the presence of cryptic fibromuscular dysplasia (FMD) (i.e. not macroscopically visible and not associated to FMD in larger arteries) in the small meningeal vessels in a comprehensive series of patients. Such a study has not been performed before to our knowledge. The meningeal tissue has been systematically examined in a series of 100 consecutive autopsies. The immunohistochemical study was performed in one case with leptomeningeal FMD. In the whole series only one case had FMD in the small leptomenigeal arteries. The histological variant was intimal fibroplasia, a rare variant of FMD. Immunohistochemistry was necessary to confirm this peculiar change of the vascular wall. Cryptic fibromuscular dysplasia in the meninges is a very rare finding in our series of autopsied patients - 1% of cases, in concordance with the literature data. The clinical associations of this lesion are difficult to be related to this lesion. A cryptic presence of FMD must be suspicioned in some cases with stroke. Angiosarcomas of the head and neck are rare tumors, the intra-oral localization being considered exceptionally in the specialty literature. The diagnosis of this kind of tumor is difficult, both to the rarity of this lesion at this site, and to the various histopathological aspects. We present the case of 70-year-old male patient clinically diagnosed with tumor of the alveolar crest of mandible, which, histopathologically, associated areas of predominant vascular proliferation, with areas of carcinoma and sarcoma. Immunohistochemical, the tumor was investigated for CD31, AE1-AE3 and vimentin. The human bodybuilding represented a complex research topic for the scientist in the most diverse domains. Although their interests and reasons were different, the goal was always the same: establishing a relation to verify the ratio between the dimensions of the constituent segments. It appears that the mystery was solved out in the XIX-th century by Adolf Zeising, a German, who, using the statistic calculus, defined the division of a segment by the gold section. This purely mathematic legity confirms the human body's integration in proportion to the finest segments, thus providing the technical instrument of building a fully harmonious human body. The present study aims to compare the ideal, the calculated perfection to the reality, namely the theoretically obtained values to the average values of an 18-year-old male. It appears that the differences refer especially to the limbs; both the superior ones and the inferior ones being longer comparing to the ideal pattern while the bust is shorter and broader. Extrapulmonary sites of tuberculosis must not be neglected as they are not so rarely fortuitous discovering. The morphological diagnosis of tuberculosis is generally easy to do. However, there are the atypical lesions rising diagnostic difficulties. The authors reviewed the histopathological diagnostic in 19 cases of osteoarticular tuberculosis lesions selected from 390 cases of surgical extrapulmonary granulomatous lesions, using for difficult cases, with atypical lesions, new diagnostic tools as immunohistochemistry and DNA amplification technique by the polymerase chain reaction. This study puts forth the morphological and metabolic modifications that occurred in the skin affected by Pemphigus vulgaris, modifications that have been studied by histoenzymatic techniques. There were studied skin biopsies from patients suffering from Pemphigus vulgaris, hospitalized in Dermatology services in Bucharest. The pieces were sectioned at cryotome, at 3 degrees Celsius and then they were studied with histochemical methods, in order to evidentiate the activity of the following enzymes: NADH2-cytochrome-c-reductase, lactate-dehydrogenase (LDH), dihydrofolate-reductase (DHFR), folic acid (FA), ATP-ase pH 9.4, leucin-amino-peptidase (LAP). The enzymatic activity was appreciated in all skin components: epidermal layers, connective tissue cells and inflammatory cells from the superficial and deep dermis, blood vessels, nerve fibers and encapsulated corpuscles. In the affected skin, there were observed modifications of all enzymes studied. The study revealed the following aspects: the balance between oxybiotic and anoxybiotic metabolism in the epidermal cells changes from the predominance of the former in the healthy skin, to the dominance of the latter in the affected skin, an active turn-over of the nucleic acids and increased synthesis of amino acids in the dermal cell population (mainly in the fibroblasts and mast cells), morphological and functional alteration of mitochondria, lysosomes and cellular membranes.